I stayed at the Garden Island Inn in 2018 and enjoyed is so much I returned a few weeks ago in 2019. Unfortunately I had a death in the family and only was able to stay one night - they were very understanding and great to work with. Looking forward to another stay in the future! Beautiful hotel, staff super friendly. Nice, clean and quiet hotel room. We stayed for just one night and left early. The only issue we had was the lighting and trying to find our unit. It was a pretty minor issue. Great location and super clean. It's a simple place though--no frills, which was great for me. 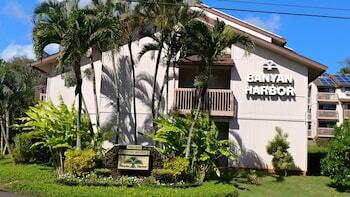 You'll love every minute in extraordinary Lihue. The clever team at Orbitz will help you get your escape underway by linking up amazing-value hotels and flights. Think of the spare cash you'll have by bundling your bookings. Pick out your preferred airfares, hotels, experiences and rental cars and you can save up to $857*! Not only that, but you'll be able to customize your getaway by picking from 500 airline partners and more than 500,000 accommodations globally. You have the freedom to choose! With unlimited options to select from, our packages will help you create that getaway you've long dreamed about. We've invented a simple program that will reward you quick! The only thing you have to do is keep booking with us and you'll receive instant Orbucks! For perks and added extras at Orbitz Rewards VIP Hotels, just become a gold or platinum member. How? Stay four nights for gold status and 12 nights for platinum status. Also, remember — you can take advantage of your Orbitz Rewards points the next time you book. Wondering just where exactly Lihue is? Lihue is around 4,900 miles to the northeast from Washington which is the nation's capital. 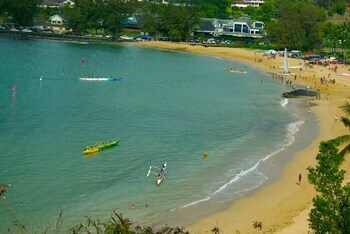 This part of Kauai is home to around 6,000 people, some of whom will surely be willing to share some travel tips. Lydgate Beach Park is a noteworthy local attraction. You'll want to see it while you're in town. Peek into the lovingly preserved rooms and imagine how the residents of Kilohana Plantation used to live. This house gives its visitors a rare insight. Want some more options? 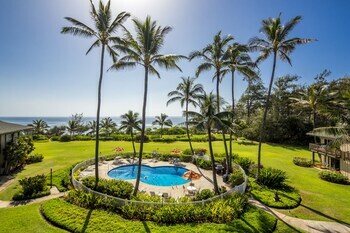 Thinking of hitting Kalapaki Beach? If it's a windy day, why not find out if you can fly a kite there? But that's not all! If you're craving a game of golf, make your way to Puakea Golf Course. It's the perfect place to work on your average while you enjoy the fresh air. How about exploring the region your own way? Be the architect of your own adventure by checking out car rentals in Lihue with the help of Orbitz. Collecting a vehicle from Lihue Airport means you'll be out of the cabin and into the driver's seat before you can say, "Taxi!" Look into Avis and Payless. 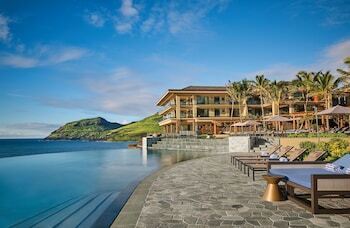 Orbitz features 26 hotels in Lihue. Score one of the top options so you can begin organizing the rest of your unforgettable vacation. Are you looking for facilities and service that'll make you feel like a rock star? 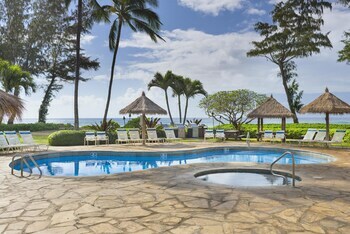 Try our luxury hotel options, the Waipouli Beach Resorts & Spa Kauai by Outrigger or the Marriott's Kaua'i Beach Club. After all, it's not every day you get to stay on an island! Though, if you're traveling on a budget, don't worry! You won't need to spend big bucks just to get a room. 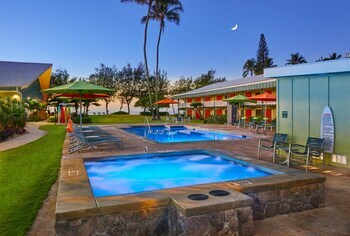 We also suggest the Kauai Palms Hotel and the Tip Top Motel Cafe & Bakery. Fasten your seatbelt! You'll soon be hitting the tarmac at Lihue Airport (LIH), the best airport for Lihue. The terminal lies 1 mile east of the downtown area and may be the starting point of your unforgettable vacation. Go to Lihue for its distinct culture and feel. Though, you also have celebrated attractions right under your nose! Tourists from every corner of the globe head to Waimea Canyon. It's easily accessible from Waimea, 17 miles away. If you have to cancel or adjust your booking, it'll cheer you up to know that we won't demand a fee.^ Your selected airline and hotel might not either if you act swiftly!